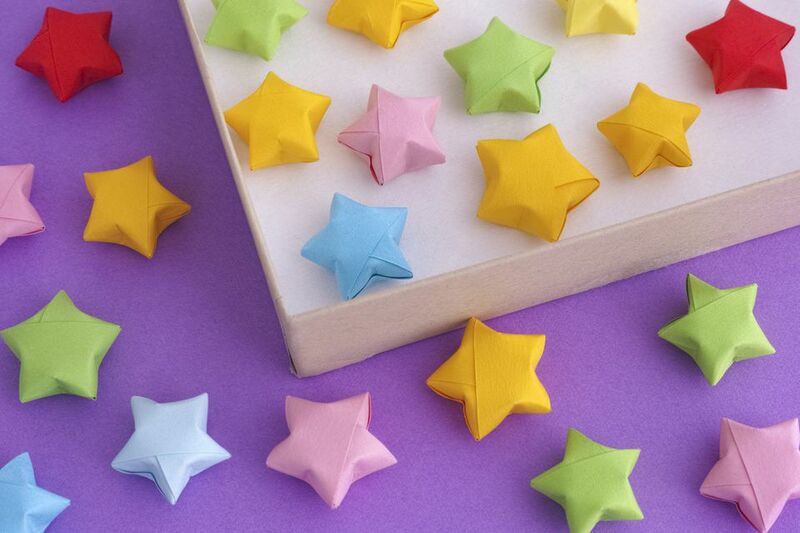 Origami lucky stars are a traditional design that can be made into a lovely handmade gift. Lucky stars are often normally given as a gift in a decorated glass jar. 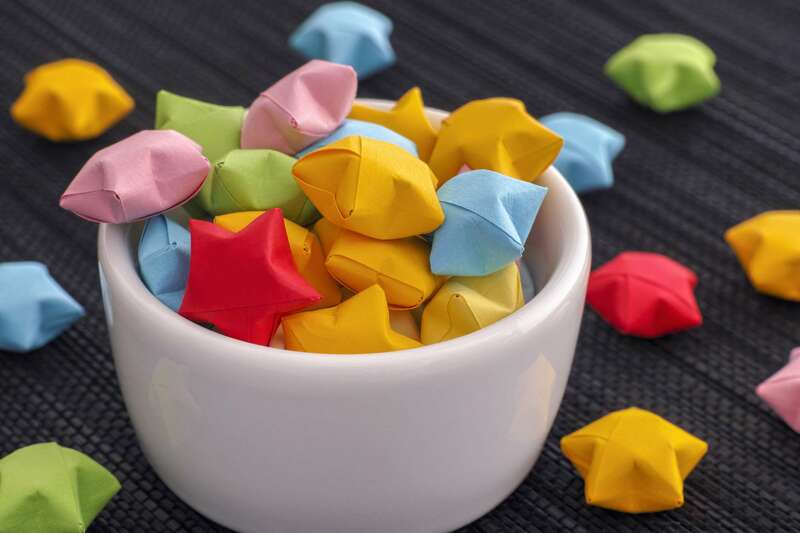 As you might expect, origami lucky stars are popular gifts for weddings and anniversaries. You can even buy jars of lucky stars from various Etsy sellers if you don't have the time or patience to try to make your own. Another story that is associated with origami lucky stars compares the stars to the traditional origami crane and says that you'll be granted one wish if you fold 1,000 stars. This story refers to the origami lucky stars as origami wishing stars. The origami star is different from other traditional origami models because it is folded with a long, thin strip of paper instead of a square. Once you've gotten the hang of folding origami stars from standard sized paper strips, try experimenting with various paper sizes to make larger or smaller origami stars. Metallic gold or silver wrapping paper would be a good source of material for this type of project. There are plenty of ways to get origami paper and you can even find them around your house. Hold your paper so it looks like an upside down cancer awareness ribbon. Tie a knot in the paper, then press gently to flatten. When finished, your paper should look like the photo to the left. Tuck the short end of the paper into the pentagon you just created. If necessary, you can trim the edge of the paper to make it fit better. Wrap the long end of the paper around each side of the pentagon, making sure to line the edges up with the initial shape you created. Tuck in the end of the paper to secure the shape. If necessary, trim the end of the paper with scissors to make it fit better. To complete your origami lucky star, gently pinch each edge of the pentagon to create small indentations. This will make your paper puff out into the desired star shape. If you don't want to put your origami wishing stars in a jar, you can string them together to make a hanging garland or use them as beads for an origami jewelry making project.